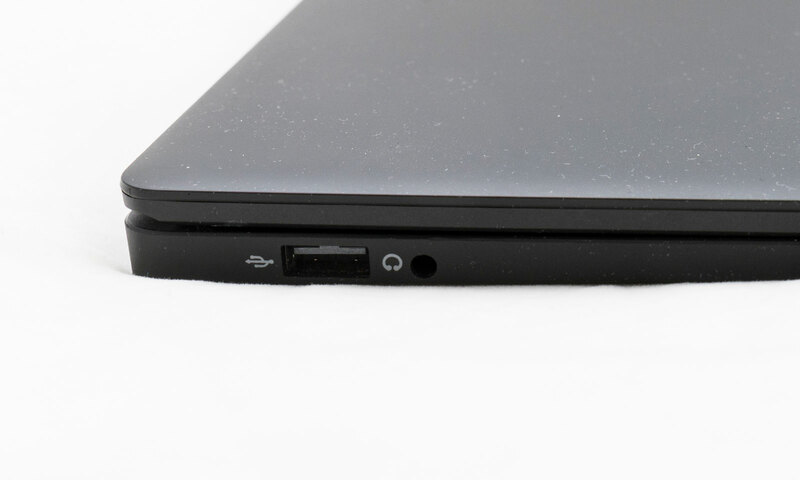 Now that smartphones are super-cheap, what about laptops? 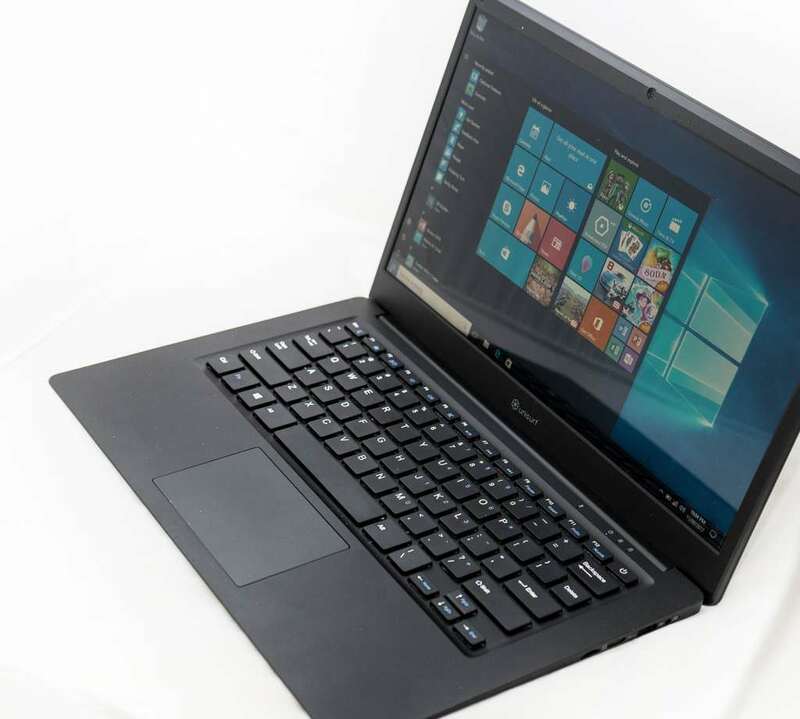 Supermarket chain Aldi is offering up a $200 laptop made for anyone who wants a cheap-as-chips computer. So what’s it like, and is it worth the price you pay? Getting stuck into the Unisurf 14, and the first thing we need to comment on is the design, which we have this to say: we hope you like black, basic, bland and blah, because this checks all of those boxes. 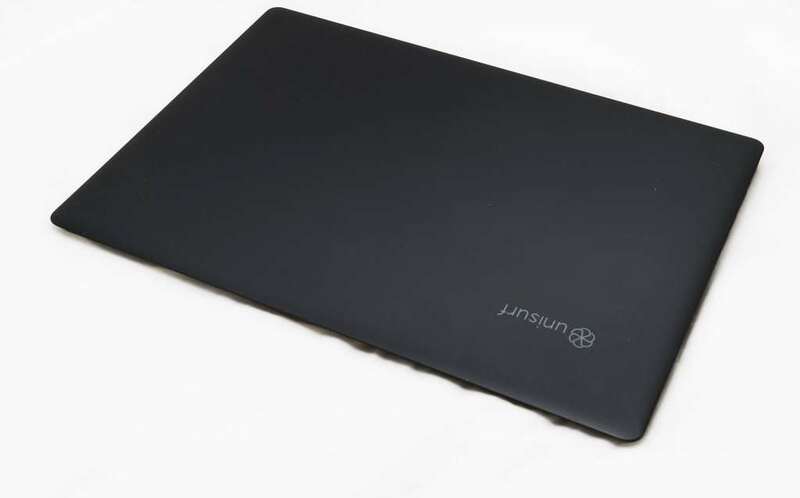 If you’re used to the silver metal surface of an Apple or Microsoft machine, or you like the style that modern hybrid machines go for, forget about it here, because the Unisurf 14 is simple, black, and made of plastic. It’s about as bland as laptop designs get, but that’s not why you’re here. No, you’re here for the $200-odd price, for the fact that you’re getting a cheap computer, and honestly, for that $200-odd price, you can’t really expect a lot in the design, or even in the feature list. 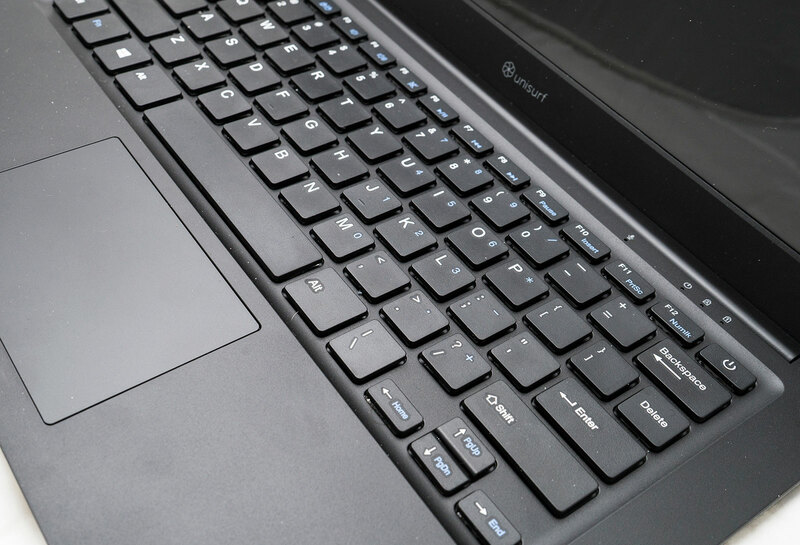 Simply put, the Unisurf 14 laptop isn’t going to be your dream machine, but it will get a job done, at least based on the feature set on the box. As such, you’ll find an Intel quad-core Atom X5 Z8530 processor made from the Intel “Cherry Trail” chips launched back in 2015. Unisurf has paired this with 4GB RAM and a very small amount of space, supplying only 32GB of storage before Windows is installed. Microsoft’s Windows 10 does come with the Unisurf 14 and arrives on the machine pre-installed, leaving you with only 15GB of space, barely enough to do anything, and after a few Windows patches, this will get cut back to a paltry 11GB. Fortunately, there is a microSD slot on the right side, effectively providing a bit of extra storage for downloading files or storing media on, which you will almost definitely need. The microSD card is optional, mind you, so be sure to BYO. 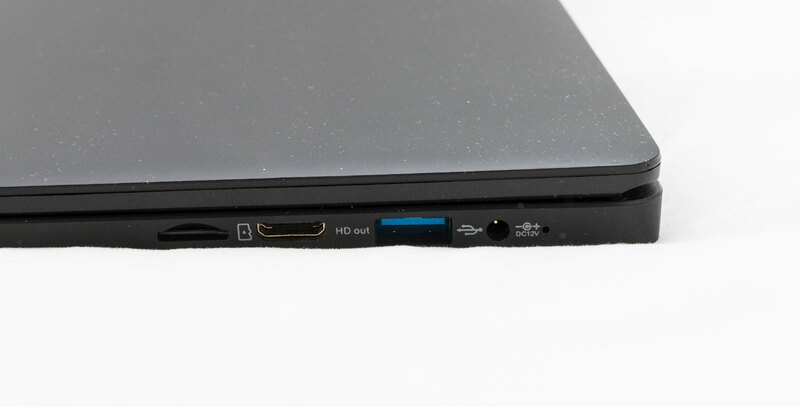 Outside of the necessities like the processor, memory, and storage, you’ll find support for 802.11a/b/g/n WiFi, Bluetooth 4.0, and both a USB 2.0 and a USB 3.0 port found respectively on the left and right, while a relatively unusual mini-HDMI port can also be found on the right side. 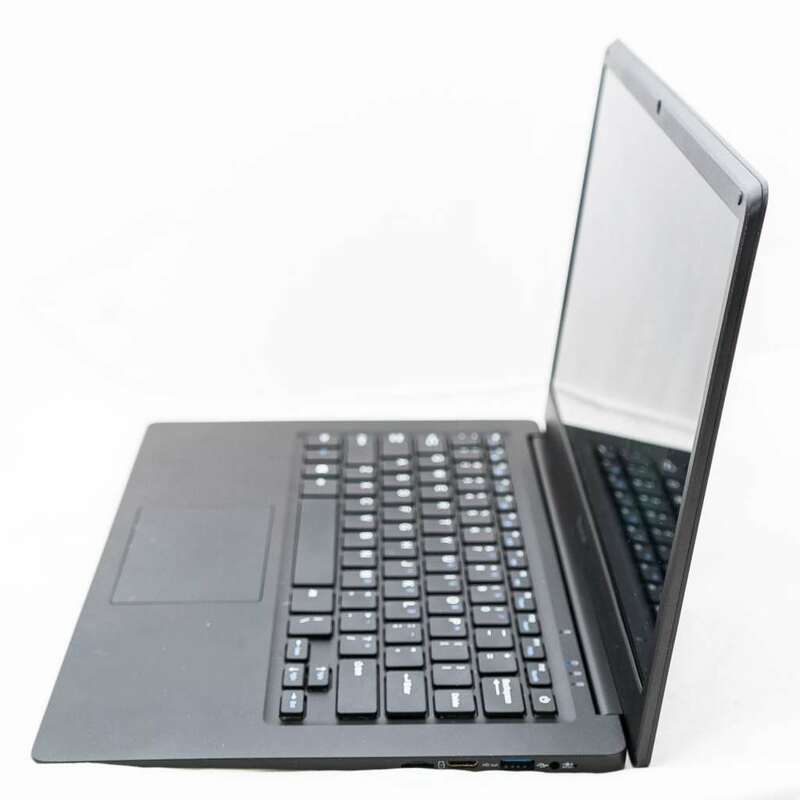 The screen is a 14 inch display offering a meager 1366×768 HD display, while the keyboard and touchpad sit below these, with a microphone above the keys and the power button as part of the computer. Switching the Unisurf 14 on and getting stuck in, it’s not hard to see quickly that the combination of specs isn’t the best on the planet, but provided you keep your activities down to a minimum, the laptop can handle what you throw at it. Somewhat, anyway. The real problem arises from patience, because if you happen to be a fast typist or expecting the sort of performance a more expensive computer would deliver, you’re going to be in for a surprise. Simply put, there is the occasional… delay, and while the Unisurf 14 can let you type in the writing app of your choice or browse the web in a specific web browser, our experience revealed that you’re going to want to keep things to only running a few apps at a time, and maybe a few tabs in that web browser. Even loading up the Windows search for apps or typing away in Evernote (once we had downloaded it) displayed the occasional slowdown, often as we typed. We suspect that’s the combination of the low-end processor and memory, though it does suggest that the Unisurf 14 really needs to have its activities kept down to a minimum, otherwise it just… delays your time. One area that you can usually expect to be pretty weak on a cheap laptop is that of the keyboard and mouse. 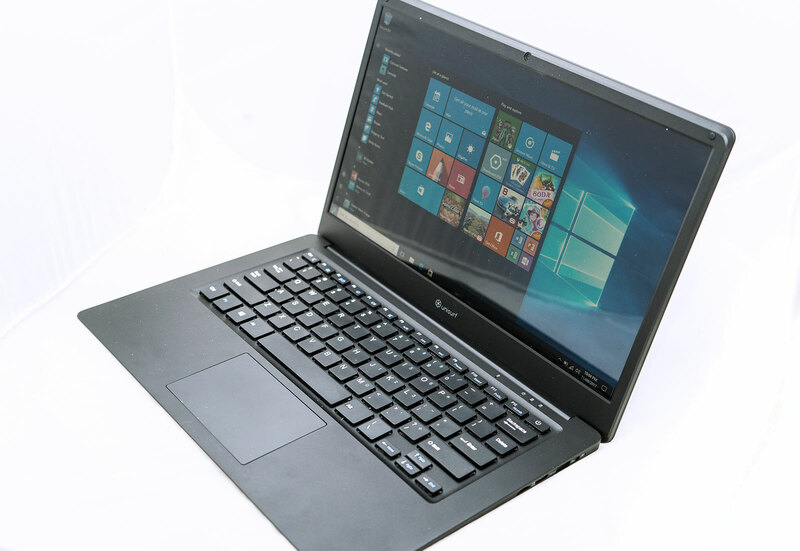 An area that companies normally have to refine over time to make good, the keyboard and the mouse on the cheaper laptops are often serviceable, but usually not enjoyable. That said, we typed this entire review with the Unisurf 14, and the keyboard wasn’t quite as bad as we were expecting, because while there was a fair amount of travel, the keys offered up a firm click, and the error rate seemed quite low. Granted, you’re not going to find a typing experience that rivals laptops from say Apple, Lenovo, or Microsoft — the benchmarks for laptop keyboards — but it’s actually not bad, and you could easily get away with typing quite a few reports, articles, or anything else on Unisurf’s keys. You won’t find backlighting here, however, so if you’re in a darkened room, turn the light on, but all up, the keyboard on the Unisurf 14 wasn’t bad. The mouse on the other hand, that became a touch grinding to use. It’s not that the Unisurf’s 14 trackpad is too small — it is, but we can deal with that — nor is that the scrolling was reversed (it was, and we couldn’t find a way to turn it off). Rather, it’s that the mouse doesn’t play nicely with the computer’s lack of speed, and so moving the mouse often feels slower than it should. You’ll put your fingers to the trackpad, move them about, but the cursor on screen will feel sluggish. It responds, but it responds almost like it has dead weight being dragged behind it, and it’s next to impossible not to notice it. You can get by, and for the price we’re not totally shocked to see something like this, but it’s just something to be aware of. 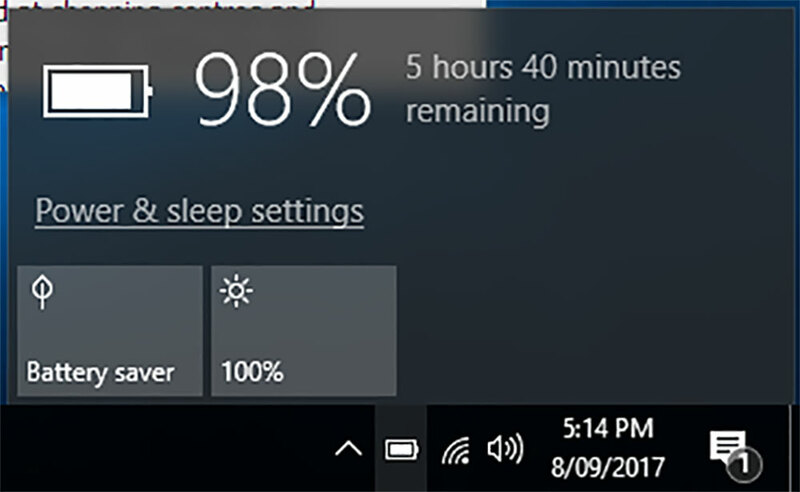 At least the battery offers up a relatively respectable six hours of life, a result that isn’t surprising given the combination of flash memory and an Atom processor, though it would have been nice to see a little more squeezed out. 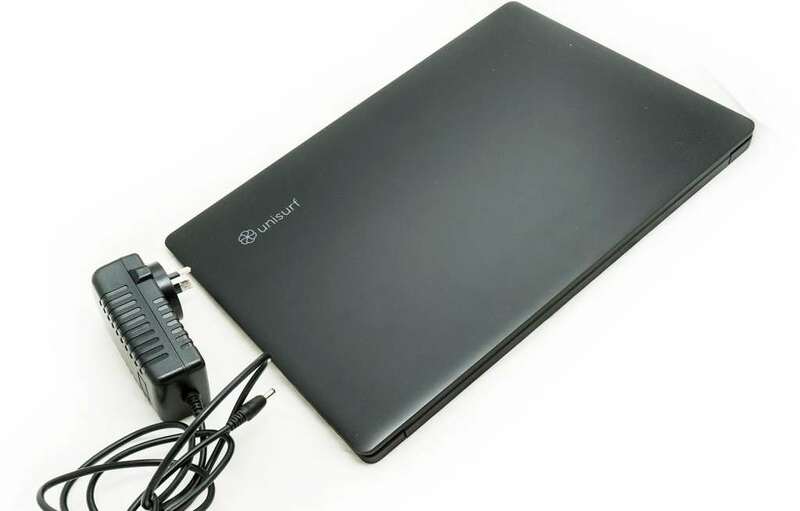 Unisurf rates its 14 inch laptop as able to provide a maximum of eight hours, something we couldn’t quite see, though it is possible that you might pull a little more out of its battery if you switch WiFi off and turn the screen down. And for its sub-$250 price, that battery life is hard to argue with, even if its charger isn’t something a little more universally friendly, like say a USB port would have been. We guess you can’t have everything. In fact, some of the things you might miss on the Unisurf 14 would include things a more expensive laptop would provide, like a touchscreen or just a screen in general that didn’t look like a washed out not overly bright display that reminds you again and again that this is a cheap machine. You get what you pay for, and the screen in the Unisurf 14 is surely indicative of that, changing colour and washing out the activity on screen depending on how you change your viewing position. The one positive side to this is at least you’ve not being charged too much more for the privilege of an equally mediocre screen on a more expensive computer. Seriously, we’ve reviewed so many computers over the years that have offered comparable screens that we didn’t like, and the laptops have arrived with far, far more expensive price tags. That price tag is hard to beat, though, because sub-$250 laptops with serviceable keyboards and a usable battery life don’t just appear all that often. But when they do, they tend to have poor storage supplies, and this one is no different. Quite seriously, 32GB of storage is just plain ridiculous for a computer these days, with 64GB really being the minimum. Now technically you can bring your own microSD card and fix things a little, but it’s not quite the same, and this will only give you another drive, not really a place for Microsoft to install apps to, or even possibly a web browser to download and store files to be cached. Simply put, more storage would have made a tremendous dent here, and the amount on offer really just makes the Unisurf 14 ideal for only a handful of things: web surfing, writing, emails, and reading your favourite technology website. Getting over the flaws of the Unisurf 14 is very easy, however, because this computer is made for a specific price, and it’s a very cheap one. We’ve seen it go for $222, but have heard it can drop below $200 as it is, making it a machine that is quite literally as cheap-as-chips. We’re not even sure how Aldi or Unisurf make money here, but you shouldn’t let that concern you. Rather, this is the machine made for kids, seniors, or just a family member that needs a way of accessing the web, writing documents, or just doing things, and doesn’t want to spend more than they think a computer should cost. We all know someone like that, someone who gazes at the shop-floor and just squints, knowing full well they should buy a new computer, but just can’t agree with the cost. Is it worth the $200-odd dollars you can find the Unisurf 14 for? We’re going to go with “probably”, simply because the buyer of this doesn’t have much to spend and doesn’t need the machine to be super fast or super special. The buyer of Aldi’s Unisurf 14 just needs a computer to do all the things computers do barring that of games. The Unisurf 14 is a portable computer made for typing, for web surfing, for emails and online shopping and social activities, and it will even handle other bits and pieces online. It won’t necessarily do all of these things well, but it will do them, and it will do them with a relatively usable battery life, which for the price is better than we expected. That makes it worth it, even if the computer isn’t the best in the world. If you can find Aldi’s Unisurf 14 and need a computer for the back to school season or for a family member that’s always borrowing yours, it’s probably worth the bargain. I bought one last weekend just to do basic coding and mucking about with wordpress and I think it’s great. $222 is a price point that got my attention. I would NOT buy them for my staff to replace their current PC’s, but for basic work it is great value for money. I bought one and have regretted it ever since. I had to buy windows 10, it wasn’t on the machine. The @ icon is on the ” button and vice versa. The cursor goes haywire a lot, the page goes mental often, the trackpad is useless often. In short it’s an annoying piece of junk. And don’t try using it on your lap, it will go haywire as it needs to be on a solid desk. That’s strange. Ours was certainly not like that, and the @ issue sounds like the wrong language was selected or installed.